Headphone design for 360º omnidirectional reception. 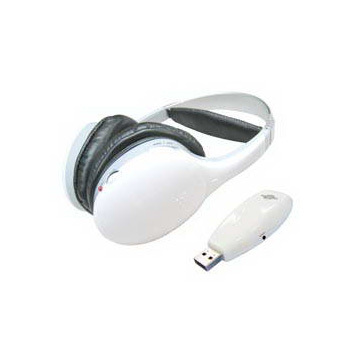 The AWS833D wireless stereo headphone system is specifically made for PC, TV, Hi-Fi, and A/V entertainment use. It utilizes state-of-the-art wireless digital audio technology to transmit and receive crystal-clear music up to 100 ft. distance even through wall and floors. It lets you sit where you like and enjoy freedom of movement without the hassle of wires while watching TV or listening to music. The AWS813R lightweight headphone features a special design of a comfortable closed ear-cup which effectively enhances powerful heavy bass and isolates ambient noise. In addition, the comfortable closed ear-cup style has a soft cushion design that perfectly suits your ears by covering them completely. All these features will guarantee you not only a powerful bass and vibrant auditory feeling but exceptional audio fidelity, combined with quiet background and ultra-comfortable ear-cups. Watching TV or DVD Video. (TV or DVD player must have audio line out or earphone jack). Listening to music from iPod, MP3 or CD players.